Villa-Lobos composed in excess of two thousand works (!) but most of us are probably familiar with only a small handful of them (e.g. parts of two or three of his so-called Bachianas Brasileiras). As with all exceptionally prolific composers there has to be more than a suspicion of “never mind the quality, feel the width”. Hence, I suspect, the tendency to stick mostly to tried and tested pieces for performance and recording. That said, there have been some adventurous pioneers. The cycle of the eleven surviving symphonies (the 5th seems to have been lost) appeared relatively recently on CPO in the hands of the Stuttgart Radio Symphony Orchestra, conducted by Carl St Clair – to mixed but generally enthusiastic reviews. Now we have an alternative cycle (differently coupled) on Naxos, with only the Tenth Symphony yet to be released. I was interested to hear the present disc because it provides a snapshot of the composer’s comparatively early works, in performances by his compatriots, and I hoped it might reveal new insights into the development of his composing style. In his youth Villa-Lobos was probably influenced by earlier Brazilian symphonists, including Leopoldo Miguez, Alexandre Levy, Alberto Nepomuceno and Henrique Oswald. He certainly greatly admired Oswald and actually went on to conduct that composer’s Symphony of 1910. Its premiere was in 1918 (1917 according to some sources) – only a year before the premiere of Villa-Lobos’s own Symphony No 1. There is a rather scrappy performance of the Oswald available on You-Tube and a brief listen to this confirms the suggestion that Oswald’s work has something in common with that of Faure. Another potential source of influence – possibly on all of the first five of Villa-Lobos’s symphonies – was the academic textbook Cours de Composition Musicale by Vincent D’Indy. This may have introduced Villa-Lobos to the concept of the cyclical form and the Second Symphony seems to provide some evidence of this approach although, as far as I can tell, there is no particular evidence of it in its predecessor. Also, neither symphony sounds either like Faure or D’Indy, so do we have here (at least for 1917) a new and original sound world? The First Symphony, subtitled “O Imprevisto” (The Unforeseen) – already the composer’s Op.112 – is based on the conventional European four-movement structure of the previous century. To me it all sounds more like “O Improvisado”. The first movement Allegro assai moderato consists of three sections and it opens with an angular theme that is complex enough to avoid being memorable. 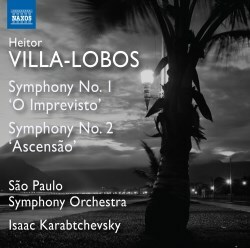 There is a Brazilian flavour all right but subtlety is not the name of the game here and Villa-Lobos predominantly employs strings, brass and timpani in a noisy and bass-heavy curtain of sound. The booklet notes suggest that a pizzicato passage in the second section is reminiscent of Sibelius but, unless you are listening out for this, the passage is so brief as to be easily missed. The second movement Adagio opens with a ‘cello theme and soon sounds like rather undistinguished film music. Fortunately, there is a bit more in the way of contrast here and we, at last, get significant contributions from other sections of the orchestra. Sadly, though, the predominant impression remains bass-heavy and the volume is ratcheted up when the composer doesn’t have much to say – which is most of the time. There is a vague flavour of the music of Howard Hanson in places but that probably flatters the present work. The chattering third movement Scherzo - Allegro vivace skips around in woodwind and brass with a Brazilian swagger and there is a descending flute scale (around 2 minutes in) that recalls the end of the first movement of Ravel’s Rhapsodie Espagnole. Contributions from celesta, harp and tam-tam are later thrown in for good measure. Finally, the fourth movement Allegro con brio returns to the noisy, bass-heavy atmosphere of the first movement. This subsides occasionally, once to reveal a theme which might have come from one of the Bachianas Brasileiras (at about 4:25) and, later, to expose extensive solos from violin and (very unusually) double bass. It all stops unexpectedly suddenly. This “unforeseen” symphony actually foresaw much of what was to come from this composer – i.e., episodic music that doesn’t evolve or develop very much, within a Brazilian sound world. I was hoping for something relatively fresh and invigorating but listening to this work didn’t inspire me to explore Villa-Lobos’s symphonic oeuvre much further – which was unfortunate because the Second Symphony lasts almost twice as long! This work is subtitled “Ascensão” – possibly because there is an ascending motif that appears early on and reappears with slight modification several times. It was given its premiere in 1944 but there are indications that it was mostly composed much earlier – probably only shortly after the First Symphony (whose orchestration is very similar). The sprawling first movement Allegro non troppo starts as if it is a seascape and soon develops an ostinato backing. As with the earlier work there is a curtain of bass and, initially, little variation of texture. Although there is some woodwind interest after 4:00 there seems to be little sense of direction and few key changes are evident. It all puts me in mind of listening to the (considerably shorter) later works of Havergal Brian who, of course, never heard most of his music performed. That was probably the case here and I wonder if Villa-Lobos would have reduced his forces - or made more sparing use of them - if he had had access to early performances. The second movement Allegretto scherzando provides more interest. There is a scampering woodwind theme with string support before the theme switches to the strings. We get some subtlety in a clarinet solo (at about 3:45) but the movement really doesn’t have enough material to sustain its length. Likewise, the third movement Andante moderato provides some contrasting textures and a respite from excessive volume in a soft tune that even starts to develop. Whilst the textures of the first movement reappear from time to time, the general mood is gentler and one quiet section features notable solos from bass clarinet and contra-bassoon. The fourth movement Allegro transforms the ascending motif into a ballad-like offering, somewhat less frenetic than in the first two movements. A quiet bass clarinet solo cadenza marks a mid-point, then we are back to episodes of modification of the ascending motif with contrasting slow sections, rising up the scale until there is a noisy climax and (finally) it all stops. Merits of the performances are difficult to assess. Orchestral technique is fine and the performers sound well-enough rehearsed. It may well be that we have here a faithful rendering of what the composer had in mind but I can’t help thinking that more sympathetic interpreters might have made greater efforts to tame some of the noisier excesses of the works. In this respect the performers are not helped by a somewhat reverberant acoustic that muddies (and probably amplifies) the overblown bass textures. Overall timings of the CPO alternative offerings are 24:25 and 49:35 respectively, but these performances exhibit rather more variability of tempo within these durations. The opening of the Second Symphony, for example, is significantly faster in the CPO version but the overall timing of the movement is over 20 seconds longer. I am afraid I cannot summon the enthusiasm to provide any more detailed comparison. Suffice to say that switching between the competing performances reveals only very slight differences. Recordings are similarly reverberant but my impression is that the CPO recording is marginally clearer. The Naxos booklet notes are quite extensive and of reasonable quality, in very passable translations. Typically, they are presented in a tiny font that is a little difficult to read. Ultimately, this disc provides a taste of the young composer and casts light on what was to come. Was this a new and original sound world? Well, yes - in some respects, but one lacking in many of the qualities required for real enjoyment of repeat performances. As might be expected both the works here are difficult to reconcile with the European view of the symphony. I’m afraid I can’t get excited about either and will probably not return to them much – if at all. The performances on offer here probably serve the composer well enough and stand up to the immediate competition – despite some muddiness in the recording. However, on the strength of music like this, I predict that it will be a long time before Villa-Lobos’s colossal catalogue of works is more than patchily represented on record.